Writhing around with a trainer on her back, an elephant is repeatedly hit and gouged with a sharp metal bullhook. As she winces in pain, the man violently yanks her ears and continues pounding the heavy tool down onto her head as hard as he can. 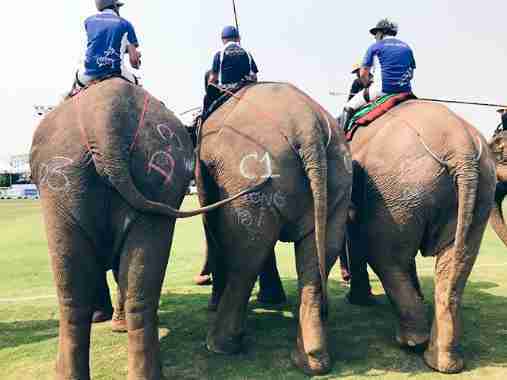 Polo is typically played on horseback, but in Thailand, there’s a cruel and unusual twist: It’s played on the backs of captive elephants instead — who are beaten and broken down in order to be trained to play the sport. Until this year, the brutal training sessions were never caught on camera. 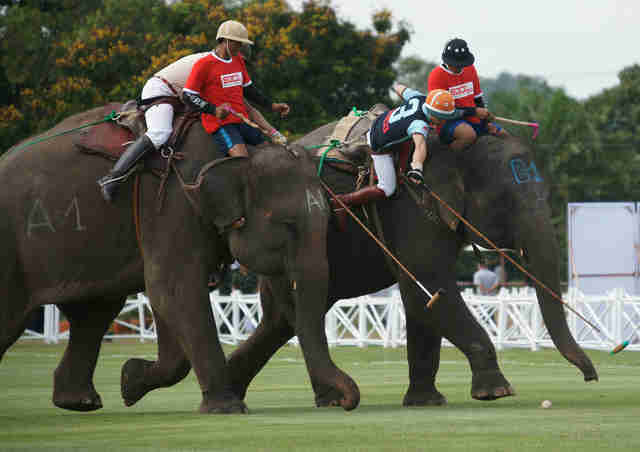 Since 2001, the country has hosted the King’s Cup Elephant Polo Tournament, a four-day competition that draws crowds of wealthy ticket-holders to Thailand each spring. The event claims to serve as a fundraiser for elephant conservation efforts — but keeps nearly 80 elephants in captivity overall. 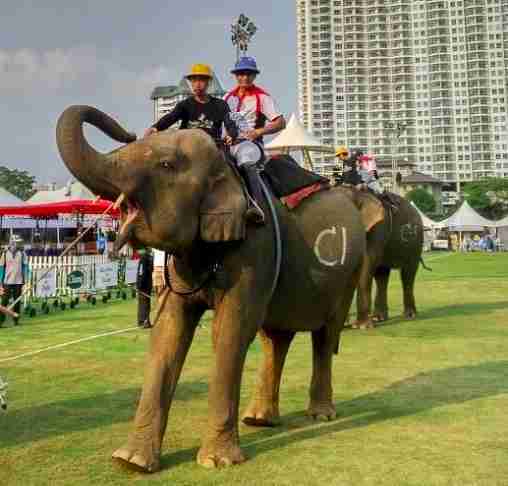 According to the event’s website, the elephants who compete were “taken off the streets” and given refuge from “street life and unemployment.” But newly-released videos, which show multiple polo elephants being abused and forced to live in chains for the event, suggest anything but an easy life for the animals now. Tom Taylor, assistant director of Wildlife Friends Foundation Thailand, has a growing list of concerns about the competition. It’s likely, he said, that the elephants were poached from the wild or captive-bred in order to be trained for the event — which often leads to a lifetime of abuse. Although the event has a clear background of abuse, it has garnered big-name sponsorships in the past including CitiBank, IBM, Dairy Queen and Ripley’s Believe It Or Not. Since the release of the video footage three weeks ago, British whiskey brand Johnnie Walker has rescinded its sponsorship — noting the sport’s suspected abuse as the reason. Since then, the page listing the event’s sponsors on its website has been disabled. Still, a page describing how ticket sales are directly donated “to charity” remains — a facade Taylor doesn’t believe can be ethical when the elephants are trained with such brutal methods. 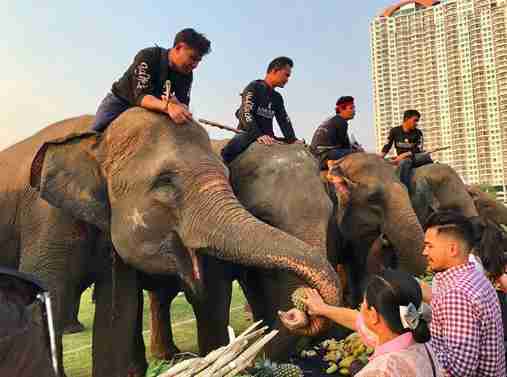 The sport remains prevalent in Thailand — and the number of captive elephants overall in the country has risen to over 3,500. 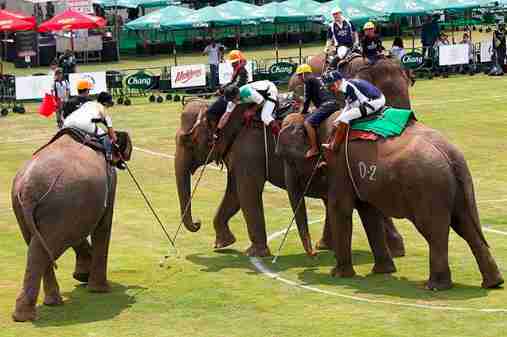 Instead of the tournament pretending to give some of these animals refuge, Taylor hopes the elephants can be moved to accredited sanctuaries in the future. To help elephants rescued from the entertainment industry, you can make a donation to Wildlife Friends Foundation Thailand’s Thai Elephant Refuge.